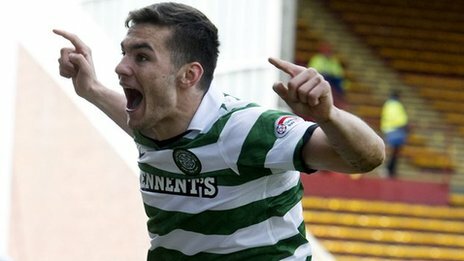 Scottish Premier League champions Celtic won 3-0 away to Motherwell on Sunday thanks to a trio of second half goals. Substitute and debutant Tony Watt struck twice before Cha Du-Ri's header confirmed victory for the visitors. Celtic dominated much of the first half, although Motherwell's Chris Humphrey was twice denied by saves from Lukasz Zaluska. The Bhoys once again took control early in the second period and deservedly secured the lead soon after the hour, as Victor Wanyama crossed to the far post and Watt managed to beat Darren Randolph with a powerful volley. Three minutes later, Watt grabbed his second, firing a finish past Randolph after being set up by Joe Ledley. Cha added Celtic's third seven minutes from time, heading in Paddy McCourt's deep cross despite the best efforts of Randolph. Stuart McCall's men remain 11 points behind Rangers in the battle for second place, with fourth-placed Dundee United now just three behind 'Well.